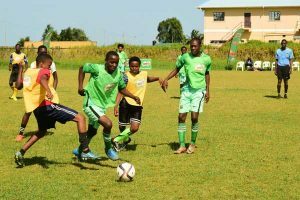 The 2018 Milo/ Ministry of Public Health (MOPH) schools football tournament continued yesterday at the Ministry of Education (MOE) ground on Carifesta Avenue with group stage, round robin action which was highly entertaining for the fans that witnessed. Sir Leon Lesson made very light work of Cummings Lodge Secondary in the day’s opener with a 10-0 trashing, followed by a Masters Academy 15-0 onslaught of St. George’s and Pure Masters wrapped up a 5-1 triumph over School of the Nations in the final match. Zian Grey led Sir Leon with a quartet of goals in the big win. Sian Jones, Teon Forde, John McKenzie, Classom and McClaren scored one goal each while Lennox Young bagged a brace in the 10-0 win. Masters Academy demolished the traditionally, football mighty St. George’s high school 15-0 to eclipse defending champions Chase’s Academy 2018 record goal tally of 13, to highlight yesterday’s play. Tyrone Khan scored five goals and was assisted with a brace each from Calvin Peters, Carl Lunch and Jonathan Barr, while Shannon Samnauth, Isaiah Anderson and Elyajah Fraser all netted one goal each in the rout. Play in the tournament continues today with another triple header that the MOE ground from 12:00hrs.